The Monday after we brought Fiz home, a major problem developed. A spot on the side of his neck swelled up to the size of a football!! It was a massive lump, so we of course got the vet out immediately to look at him. At this point we were not sure what had happened. It could have been just about anything, from something really serious to something not so serious. Well, it turned out, he had a reaction to a tranquilizer given to him by the previous owners to sedate him for clipping prior to us picking him up. And HOLY COW what a reaction it was. 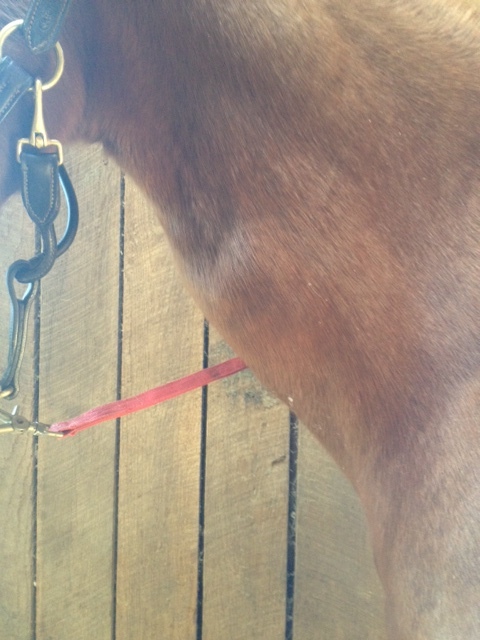 He had to be on antibiotics, he got banamine injections and paste, and we had to use DMSO gel, and then poultice. It was a major ordeal that went on through several weeks of non-stop care and treatment. Our guy was a decent patient, and he was mostly tolerant of us messing with him all the time, taking his temperature, and feeding him pills and powdered antibiotics in his food. It was tricky though, and we really had to watch him. He’s too smart for his own good! He would only eat the pills with a handful of grain for EACH of the 12 pills we had to give him each day. The powder was mixed into his sweet feed, but you had to make sure to mix it up good or he wouldn’t eat the parts with it on there. I wish I could say we had pictures of the giant bulge from day one to healing, but unfortunately we do not. All we have is the pretty large vet bill we got just days after we picked him up! I will spare you from having to see that mess. We are glad it’s paid and over, and he is healthy again! Here is a picture taken within a few days of the initial reaction. This actually looks better than day one. The picture doesn’t do this thing justice!